Usage: Hotel, office, home, kitchen, living room, diner room, bedroom, bathroom, restaurant, coffee shops, bars,library, KTV, etc. About Return: If you don't keep the painting, please contact us within 48 hours. We will be very appreciated to your cooperation. Sincerely suggests: When you buy, please make sure your products are supplied by Mode Art. Mode Art promise to offer 100% satisfied product. If any doubt or disappointed, please let us know at once, we will respond within 8 hours. 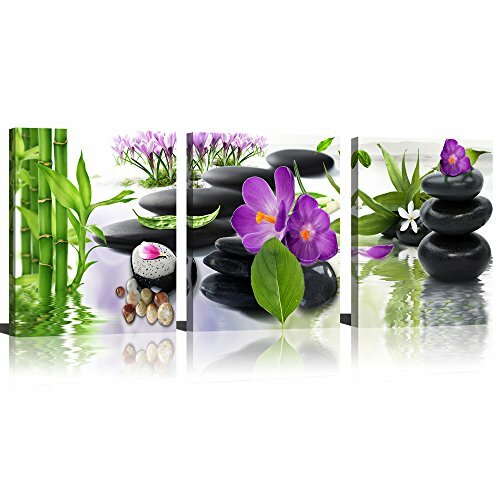 Light purple flowers & green bamboo and leaf modern zen style canvas print wall art, this set will bring a peaceful feeling. Packed in carton box, stretched with wooden frame on the back and ready to hang. Stored in Amazon warehouse in US and deliver to your hand in 1-3 days by Amazon directly. Great service: Any question, pls contact us, we will come to you within 8 hours. Every customer's helpful suggestion is appreciated, hope we can be better and better under the impact of your advice. If you have any questions about this product by ModeArt, contact us by completing and submitting the form below. If you are looking for a specif part number, please include it with your message.